Toronto Star: Severance or Weston HCD? The next few weeks are critical ones for the heritage sector. In late November, the Environment Committee is expected to report back to Parliament on Bill C-323 – An Act to Amend the Income Tax Act (Rehabilitation of Historic Property) and also wrap up its recommendations on the milestone study, The Preservation and Protection of Historic Places. This is a time for every heritage leader and organization to be engaged and informed. We strongly believe that our individual and collective responses must be loud, strategic and coordinated. Please join our weekly calls to develop and share strategy for action, craft media messaging etc. We are counting on you to engage your own networks and members. We are looking for provincial/territorial or regional “captains” who will help rally the troops and share news and action plans. Feel free to forward this invitation to them. Thanks! See our website for more information. Watch this newsletter for updates! The Environment Committee hearings were wide ranging covering topics from conserving indigenous heritage, lack of a binding heritage law for Canada, the need for financial incentives, issues with the National Register of Historic Properties, the role of Park's Canada and others. In much correspondence with proponents of Bill 323 the governing Liberals have expressed no support for the Bill, yet do make suggestions they recognize the need for support for the sector. The findings of this committee will be very important and will arrive at a rather difficult time of the year to respond, but respond we must. Keeping in touch with the National Trust for guidance and updates is important. Also contacting your MP to let them know we are hoping for great things from this review. The John H. Daniels Faculty of Architecture, Landscape, and Design at Knox College, part of the University of Toronto. The original Knox College portion is on the left, facing south down Spadina Avenue. "Have you seen the new faculty of architecture?" For the past six months, every architect or designer I've spoken with has asked me that question, and then shared his or her thoughts on the stunning new design by Nader Tehrani and Katherine Faulkner of NADAAA. Few, if any, have talked about the Knox College portion except to perfunctorily say it's wonderful that an old building was saved. Perhaps James Smith's and John Gemmell's gothic-revival building, designed in 1873 and completed in 1875, has been staring down the wide barrel of Spadina Avenue for so long, folks just take it for granted. Or, they don't even see it any more: "This is a weird black hole," says Richard Sommer, dean of the John H. Daniels Faculty of Architecture, Landscape, and Design. "Because my job is to go out and tell people about this project for the last six years, well, they'll ask, 'Where is that?'" he says. "And then they say, 'Oh, I run up Spadina,' so I'll say, 'Okay, so you've been running past this site.'" The University of Toronto didn't really "see" Knox College either in the decades leading up to its rebirth. Just before talks began to transform the Spadina Crescent building into the heritage portion of the new architecture HQ, it had been taken over by visual-arts students who didn't care about the "rotting" building with the "Barton Fink atmosphere." Knox College, on the University of Toronto campus. "It became this place where [the university] stuck things that didn't fit elsewhere," Prof. Sommer continues. "They had the eye bank here, they had the department of elevators, [and] they had the parking office." The reason for these rather unceremonious usages – on what is a very ceremonial circle of land designed by landowner, lawyer, reform politician, responsible-government advocate and gentleman architect William Baldwin in the 1830s – can be attributed to the faint echo of the Spadina Expressway controversy of the early 1970s. In the 1960s, when the invasive asphalt monster was still on the books and the university was rapidly expanding to the west, buildings were designed to show their backs to Spadina: why face 10 lanes of traffic? Even after the 1971 cancellation, there remained a "psychological" factor for decades, Prof. Sommer says: "They just never thought of it as a major asset; this was really the backwater of the campus." With the 2016 refurbishing of the Beinecke Rare Book Library, Gordon Bunshafts translucent marble reliquary built in 1963, Yale completed a decade-long program of renovating the universitys collection of mid-20th century architectural masterpieces. Also last year the Yale Center for British Art  Louis Kahns last building, which opened in 1977  completed its renovation, with the original finishes beautifully restored and state-of-the-art new building systems. Preceding years saw the rollout of similarly significant renovations, including the Art Gallery (Louis Kahn, 1953); Ingalls Hockey Rink (Eero Saarinen, 1958); Morse and Ezra Stiles Colleges (Saarinen, 1962); and the Art & Architecture Building (Paul Rudolph, 1963; renamed Rudolph Hall in 2010). These restoration projects, all impressively well executed, are testament not only to the universitys stewardship of its architectural heritage but also to its role as a powerful patron of progressive modern architecture in the middle of the last century. 1 Yale was, in those years, an institution with the confidence to promote contemporary architecture as the proper expression of its own progressive ideals and the means to equip it for the future. How glaring, then, is the contrast with Yales most recent architectural production. I speak of the two new residential colleges that have just been completed near the heart of campus; a superblock of neo-Gothic fantasy designed by Robert A. M. Stern Architects. The decision, made in 2008, to increase the number of residential colleges from twelve to fourteen in order to expand undergraduate enrollment committed the university to its most expensive and symbolically freighted construction project in the last half century. This massive undertaking was justified as a forward-looking imperative to prepare Yale for the globalized future. But why then would the university choose to revert to an archaic, centuries-old visual language? Clearly Yales resolve to address the challenges of modern times no longer extends to its architectural patronage. As it embraces a globalized future, why would the university revert to an archaic, centuries-old visual language? To be sure, Yale has commissioned some fine buildings of stimulating contemporary design in recent years, but these have all been lesser facilities on the campus periphery. 2 When it came to the Big Project  the new residential colleges  the university went to Robert A. M. Stern, then dean of the architecture school, who could be relied upon to deliver a building in the Old Yale tradition. Robert A.M. Stern Architects, or RAMSA, has indisputably done that, with a masterful recall of the style of the original residential colleges created by James Gamble Rogers in the early 1930s  which themselves, with their picturesque Gothic revival and neo-Georgian garb, were sham; self-conscious evocations of the campuses of Oxford and Cambridge. 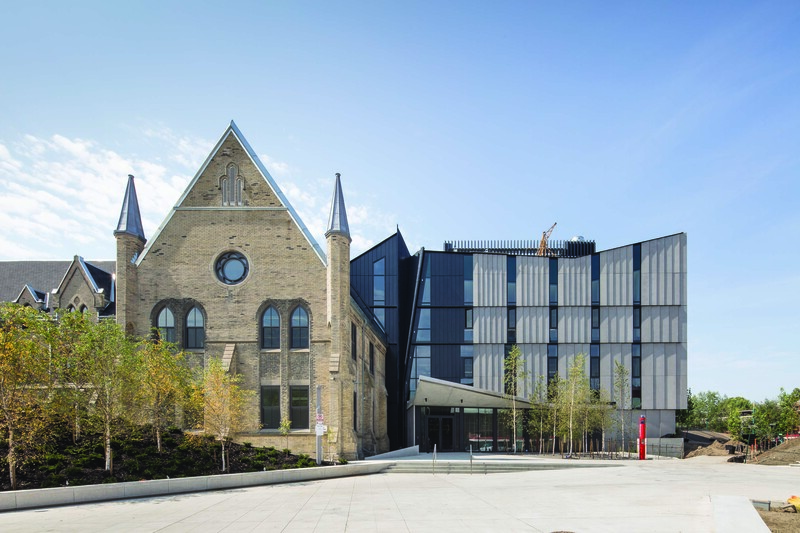 Editor's Note:Lengthy but interesting piece on Yale University's architectural patronage, read alongside the story of the Daniels Building for the Faculty of Architecture, Landscape and Design at University of Toronto. 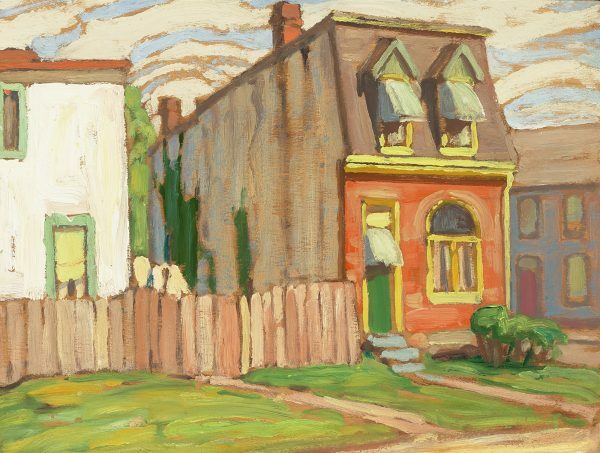 In May 2016, a Lawren Harris painting entitled Toronto House was offered at auction, and purchased by a local art aficionado for $115,000. Produced around 1920, this charming, diminutive oil on panel, 10.5 x 14 inches in size, features vibrant colours. Details regarding the owner of the home depicted in this work and its location in Toronto were unknown. Its provenance, however, was irrefutable; the painting had been part of the estate of Harris’s second wife, Bess Harris, and after her passing, owned by his youngest son, Harry K. Harris, until last year’s sale. Compared to Harris’ dramatic northern landscapes, his Toronto House paintings are less known and appreciated. The purchaser was however very interested to learn more about the work, particularly where the original house might have been located, Harris’s connection, whether it still existed, and if there were archival photographs. We were hired to carry out the research. Due to the absence of a street name, the purchaser understood there was no guarantee of success. Moreover, since so many of Toronto’s workers’ cottages have been demolished, the initial assumption going into this project was that the house in this painting had fallen victim to the wrecking ball years ago. Surprisingly, our hypothesis proved to be wrong. 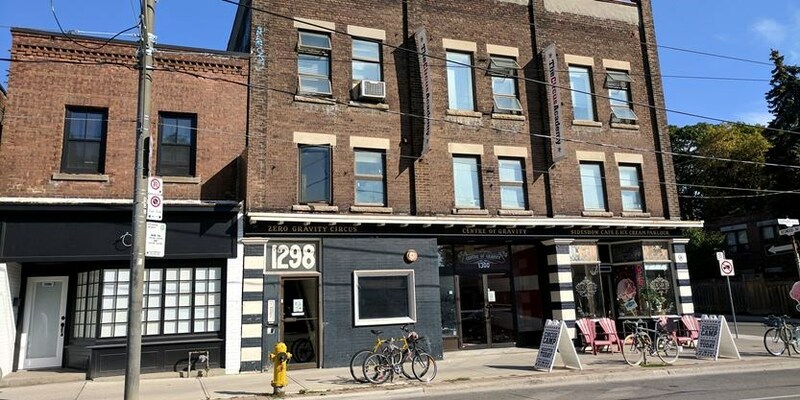 Leslieville residents Robert Indrigo and Maria Karam recently became the sole owners of 1300 Gerrard St. E.
Despite a period of uncertainty, the future of 1300 Gerrard St. E., a circa-1914 vaudeville theatre in the Little India neighbourhood, looks to be a bright one. In recent months, there has been a lot of speculation about what would happen to the building formerly known as the Centre of Gravity. Many in the community wondered on social media if the unique edifice would be sold to a developer or if it would be leased to a major corporate tenant. After discussions with lawyers, an agreement has now been reached for longtime area residents Robert Indrigo and his partner Maria Karam to buy out co-owner Eli Chornenki for $2 million and assume sole ownership of the historic property. “It’s official. As of November 1st, the deal has closed,” Karam, who along with Indrigo has co-owned 1300 Gerrard St. E. for almost 10 years, told Metroland Media Toronto late last week. Karam, a scientist, inventor and entrepreneur who develops innovative sensory systems for the body, said the plan is to start afresh, while remaining focused on their goal of creating a community arts hub. “We’re going to take over and basically rebuild from where we started back in 2008,” she said. Uncovering the truth of what this country is and has been requires preserving the places that evoke our history. We cannot learn what we allow to be forgotten. At the corner of Geneva and North Sts. 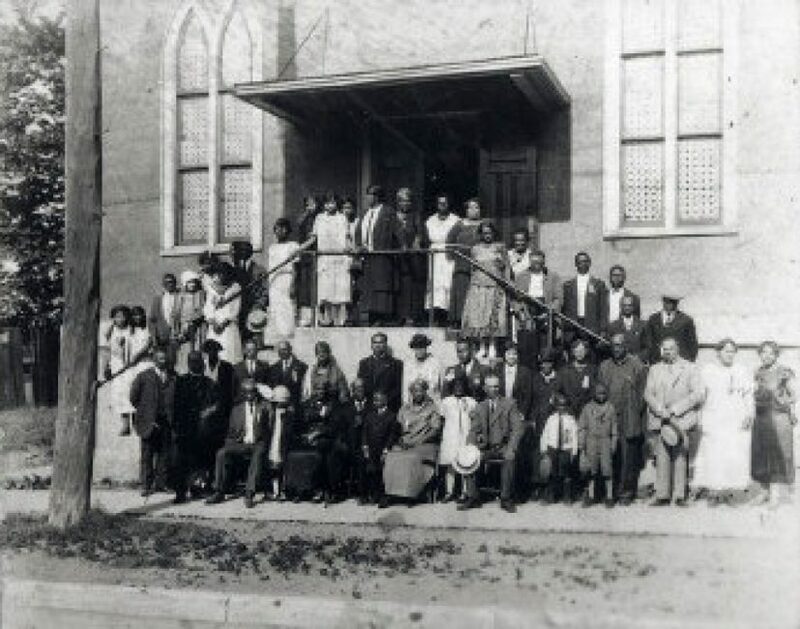 in St. Catharines, Salem Chapel stands on the land it has occupied since 1855, marking a home for formerly enslaved Africans fleeing the United States. Yet a long history is no guarantee of a continued future. The congregation at Salem Chapel is raising money through GoFundMe to pay for the building’s upkeep. A butter cream coloured building, whose windows are trimmed in burgundy and white, it’s clear someone loves this place. A lush and vibrant garden lines the outer wall while a memorial garden, a veritable oasis, invites you to sit a spell. Up the red stone path, you will find a bust commemorating the church’s most famous congregant and her Canadian life. 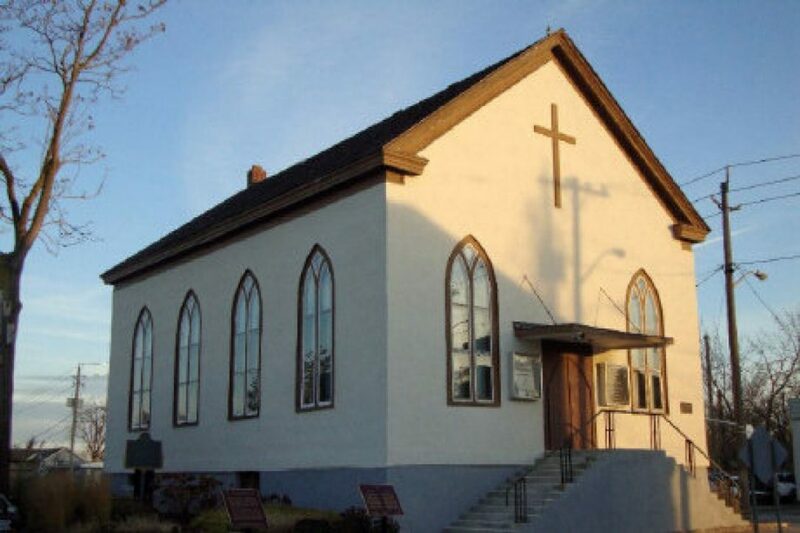 At the height of her work freeing slaves, Harriet Tubman lived in St. Catharines and worshipped at Salem Chapel. “What is remarkable is the fact that her life is a Canadian as well as an American story, and although she is barely mentioned in most Canadian history texts, she deserves a place of prominence in the mainstream of Canadian history,” wrote Graham Reynolds in Viola Desmond’s Canada. For so long, Black people’s history in Canada has been under taught. At a party in Toronto, a young white woman told me that until she went to university, she hadn’t known Canada once had slavery. Other histories too are untold. Despite being the “Promised Land” for formerly enslaved people, southern Ontario was not a paradise for Black people. A series of newspaper pieces posted at the St. Catharines City Museum tell the story of Aaron Young, a barber who wanted his wife to be able to go to the local bathhouse. Aaron and his wife were both denied entry. Although the bathhouse employed Black people, they were not allowed to use its facilities. Undaunted, he wrote an ad and had it published in the St. Catharine’s Journal. 8. Toronto Star: Severance or Weston HCD? A development proposal to knock down an old house and put up two new ones is part of a larger conflict between heritage and intensification. Dave Bennett and Cherri Hurst are part of a group trying to broaden the boundaries of a Weston heritage conservation district, which places additional restrictions on what can be built or demolished within the district boundaries. Instead, they're finding the aging house they're hoping to tear down and replace with two new ones is becoming the centre of a conflict between those who want to preserve the neighbourhood's eclectic character, and provincial plans that favour intensification. Lopes told the Star. Ive talked to my neighbours, Ive explained what Im doing and the architect says it seems very good. The lot he wants to sever is 16.15 metres wide, or 53 feet. The application hasnt yet been considered by the committee of adjustment  the group of residents appointed by city council to assess applications for building projects that diverge from what is allowed in city bylaws. Even so, the proposal has garnered the attention of the Weston Historical Society, the group of residents who have spent more than a decade fighting to make the area a heritage conservation district. said Cherri Hurst, president of the Weston Historical Society & Conservation District. Im trying to find out if thats going to trump conservation districts. she said, but to make sure that the development happening in the neighbourhood is consistent with Westons character. Hurst was one of the original proponents of a Weston conservation district in 2004, an idea that neighbours formed in response to a development proposal on Fern Ave. that Hurst called destructive. Katharina G. Andresen, 22, could have faced a fine of up to $6.2 million if the penalty was based on her assets. Charles Manson, 83, who is serving seven life sentences in Corcoran State Prison in California, has been suffering from health issues for some time. David Stephan and his wife Collet Stephan are seen in this file photo from March 2014. Stephan wrote a Facebook response critical of the judges and prosecutors on the case after the Alberta Court of Appeal upheld the conviction. A small section on the west side of the neighbourhood was declared a heritage conservation district by the city two years later, placing additional restrictions on what can be built or demolished within the district boundaries. an area that includes Lopess property on John St. There are 24 heritage conservation districts in the city of Toronto, and 37 nominated areas. Of the 37, 11 have been authorized for planning by city council, and 13 are under study. is one of the 17 nominated areas that has been nominated but isnt under study. the citys website says. To do this the districts come up with plans that must be taken into account by the city when development proposals come in. said Michael McClelland, the founding principal of ERA Architects, who specializes in heritage planning. The key, he said, is to make sure that a district implements restrictions on development only in furtherance of heritage aims, and leaves room for intensification strategies and community renewal. Hurst believes heritage designation can also be a way to increase property values and improve community safety. Amber Stewart, the lawyer who submitted Lopess application to the committee of adjustment, said she wasnt surprised to learn that some residents had reservations about the proposal. Which Toronto buildings deserve heritage protection? The Garrison Common Cottages, also known as the Robinson Cottages, are one-storey houses southeast of Trinity Bellwoods Park. They predate Confederation, lack heritage protection and some have been demolished recently. The house at 40 Mitchell Ave., right, has recently been sold and may also be vulnerable. That's the question facing Toronto as some parts of the city experience rapid, intense development: Which buildings deserve to be protected as heritage? And downtown, a group of neighbours is casting their attention to a set of cottages that are older than the country – but which are being cut down. Stories such as this one are a symptom of heritage planning that is constantly trying to catch up with development proposals, and city staff are considering a major effort to get ahead of development and aggressively study the entire city. Now dubbed the Garrison Common Cottages or Robinson Cottages, the houses, originally 40 or 41 of them, were built as workers' housing between 1858 and 1865 on what's now Adelaide Street West and Mitchell Avenue. Two have recently been demolished for new development and two more, at 40 and 44 Mitchell Ave., have just been sold. In 2014, Liberty Entertainment Group was awarded a 20-year-lease to take over operations of Casa Loma. One of the objectives of the newly opened restaurant, BlueBlood, pictured on Nov. 9, is to make the heritage site one of the city’s most prolific. PHVisiting Casa Loma, the venerable Gothic revivalist landmark that straddles the border of Toronto's downtown and midtown like a looming grey-brick sentinel, its 6,000 square metres were abuzz with activity on a chilly fall evening. The southwest garden entrance attracts a cluster of teenagers waiting for the gates to open on the Legends Of Horror haunted house attraction, while the main entrance hosts groups entering or exiting one of the property's three "escape room" attractions. Amid the confusion of so many doors leading to so many different live-action puzzle boxes and chambers of horror, and the general anxiety of darkening the doorstep of an enormous castle, a valet parking attendant in a tuque proves helpful, asking, "Here for the steakhouse?" The steakhouse is BlueBlood, a newly opened upscale dining establishment inside Casa Loma that attempts to make a virtue of its garish opulence. As a restaurant concept, BlueBlood is bizarre, confounding, sometimes even a bit annoying. But it's a project years in the making. The renovated building at 150 Symes Rd. retains much of its original rough charm. Although 99 per cent of guests will never see it, there's a wonderful "tell" in the catering kitchen of Toronto's newest event space, the Symes, at 150 Symes Rd. in Toronto's ascending, former meat-packing district near St. Clair Avenue West and Weston Road. There, partly obscured by gleaming stainless-steel sinks and snaking PVC pipes, stenciled directly onto the buff brick wall is: "NO FIREARMS BEYOND THIS POINT." The Symes, you see, had an industrial – and somewhat dangerous – past. Opened in 1934, the handsome, striped, porthole-windowed building was once known as the Symes Road Destructor. Until it became simply a waste-transfer station in 1977, it destroyed garbage via intense heat. Of course, dangerous flames aside, this still raises the question: Were there so many garbage thieves in the 1930s and 40s that city workers were required to arm themselves? "I have no clue," chirps Viviana Kohon, her excitement palpable. "We left it for the chefs because we thought they would get a kick out of it." Chefs, and guests alike, will also get a kick out of the fact Ms. Kohon and her partners, Namita Tandon-Walsh and Caitie Yue, have allowed the grand, old art-deco dame to show off even more of her rough charm. The massive steel beams that hold up the roof are mottled with age; the thick, concrete columns are chipped away near their bases; in hallways and bridal ready-rooms alike, there are walls of intermittent metal strapping and pockmarked plaster. "We're all about restoration and respecting the bones of the building," says Ms. Kohon, who once produced television shows until she began Blast Events, which organized everything from Dîner en Blanc in Niagara to hosting Chinese artist Ai Weiwei. "We tried to keep as much original as we could." When Mayor W. Stewart ceremoniously purchased the first ticket at Toronto's new coach terminal on Dec. 19, 1931, a throng of men in hats filled the waiting room. Attorney General W.H. Price was flanked by women in furs as he cut the silk ribbon to officially dispatch the first coach from the covered bus bay. It was a different time. The Union Jack flew over the Bay St. entrance. And coach bus travel was an elegant affair with a splendid art deco building to match. As the terminal lurches towards its 87th year, a group of young designers is gathering Saturday to imagine its next life. Architectural Conservancy Ontario (ACO), a charity devoted to heritage preservation, has made the terminal the focus of its sixth-annual design competition geared toward students and young professionals. Organized under the charity's NextGen program, the competition uses the charrette format, an interactive brainstorming session open to a broad range of participants. The day-long session includes talks from experts, a tour of the building and a design contest judged by industry leaders and attended by city staff. The format gives young people a "time to shine" in front of leaders in the field, said Pauline Berkovitz, a volunteer board member for ACO NextGen. A participant in last year's contest, which focused on the Wellington Destructor, is now working on the project, she said. The event is geared toward design students and young professionals but is open to "anyone who wants to share their ideas," she said. There are people who are going to know AutoCAD and know everything about 21st century beam posts, then people who are interested in art and the city," she said. The future of the terminal, located at 610 Bay St., is up in the air. Talks have been underway for months to move carriers like Greyhound and Mega Bus to Union Station, where Metrolinx started construction on a new bus terminal this summer to serve GO Transit. That's why now is the perfect time to start dreaming of the possibilities. For Scott Weir, a principal with ERA Architects who will speak at the event, the challenge is figuring out what makes a place special and then carrying that to its next life. "When something gets so tired but it still has quite a bit of what made it interesting there, its quite exciting. You can bring that part forward ... and give it new use. Weir sees a "beautiful limestone building" from architect Charles Dolphin, who designed the building partially retained as the Air Canada Centre. And though the building's function as a bus terminal has been consistent since it opened, renovations over the decades, like expanding the waiting room, have detracted from the original splendour. "Now it's a little bit messy in the way that it's been reorganized," Weir said. But he points out its connected now to the PATH system, making it a useful site. With a recent wave of projects approved and in planning for downtown and along nearby Yonge Street, Weir predicts the changes to the area's character will start to show in the next few years. And though the need for housing is still high, it might be time to think about what's next. "So many people have moved into that neighbourhood. Maybe its time to think about: Do we need more office buildings, do we need secondary services?" Berkovitz, an interior designer by day with Kate Zeidler Interior Design, is excited by the possibilities that lie inside the building. Heritage preservation often focuses on exteriors and facades, but the fact that the terminal is still operating under its original purpose gives a new set of tools to play with  tools she says are often overlooked in adaptive reuse projects. "Theres so much internal beauty. Between lights and flooring and the way the environment flows inside," she said. Though she concedes the space isn't always as gleaming and the travellers aren't dressed in their finest, as they were in the '30s, the structure is the same. It was quite spectacular, because before planes, trains and automobiles and all the other fancy ways of travelling, this really gave a sense of arrival to Toronto," she said. "There was a sense of grandeur in the space that I think can be recaptured. Text description provided by the architects. A multi-functional facility was built on the site with a very small area of 3.95m x 15.15m and lost part of the planned area. Architecture - in this case - as a complex living body with many functions: office, shop, studio for rent, studio apartment .... A programmatic project, extracted From the perception of interaction between people and the city. For more than 40 years, the Johnson Publishing building was home to Ebony and Jetmagazines, important cultural institutions that chronicled black success in America. The 11-story building now sits vacant on Michigan Avenue in the South Loop after Columbia College bought it in 2010. The college put the historic building back on the market last year and hopes to sell the building this month. The Chicago City Council is expected to vote on whether to designate the building a landmark by the end of the year, but theres a catch. The move would only preserve the buildings exterior, meaning that the few remaining interior features  some of which are extravagant even by todays standards  could disappear. A spokesman for the citys landmarks commission said interior-design elements usually arent protected because its difficult to monitor changes to things like carpets or wallpaper. The prospective owner is 3L Real Estate, a development company that repurposes historic and vintage buildings. Joseph Slezak, the companys founder and CEO, said he expects to transform the space into a mix of retail and apartment units by the end of 2019, and there are plans to include an homage to the buildings history. Editor's Note:Tamara suggests that some of the interiors are worthy of conservation in Smithsonian, ala Julia Child's kitchen. They are pretty spectacular, and very well preserved.